Click here to go to BAUDOT's background. Click here to go to ASCII's code page. Click here to go to the IBM PC's original code page 437. How is electricity created. See pictures. Click here for the atomic makeup of the major elements we see. Click here for the complete Periodic Table of elements, grouping them by "courses" or periods. Click here for the earliest "electric machines" starting in 1663, called friction machines. Click here for a basic tutorial on static electricity, atoms and ions. Click here for a timeline of the battery or cell -derived from the Greek "kalux" — to conceal (shell) or cover - invented in 1800 by Alessandro Volta. 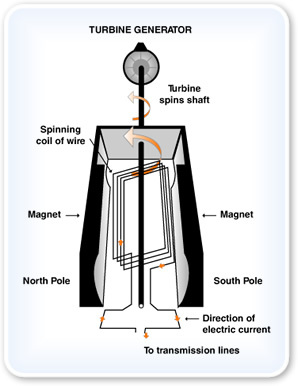 Click here for a definition of magnetism and a simple experiment using a battery. Click here for background to the electric telegraph and that famous message in Morse code transmitted over an electric circuit between Baltimore and Washington (a distance of 64 kilometres) in 1844 "What hath God wrought". Click here for the relationships in the use of its language: How volts of difference in charge between two points on a closed circuit divided by ohms of resistance produces amps of current and watts of power (by using coulombs of excess electrons/protons to specify joules of energy per second). Click here for a Yahoo article on current, both DC and AC (and how it lights a light bulb). Click here for an image and article contrasting the drift velocity (in wire) of free electrons under an applied electric field (in the order of millimetres per second), their actual speed (a million metres per second), and the signal's communication speed (i.e. the speed of light). Click here for further background to electric fields (formed whenever voltages push or pull) and magnetic fields (formed as the coulombs of electrons actually move). Click here for the electromagnetic frequencies and the discovery of radio. Click here for an easy to read article on how radio waves normally pass through walls (they're so big), and gamma waves pass through walls (they're so small), but light waves normally do not. Click here for how the Voyager Spacecraft is then able to transmit over a distance greater than 10 billion kilometres. Back to magnets. Click here for a simple tutorial on ferromagnetism and electron spin alignment, found in both permanent magnets ("hard" iron) and electromagnets ("soft" iron). Click here for more about electromagnets and field polarity (north-south) as the north-seeking point of any magnet is pushed (or pulled) towards its attractive polar opposite. "Great (is) the Lord and greatly to be praised in the city of our God in the mountain of his holiness. Beautiful for situation, the joy of the whole earth, (is) Mount Zion on the sides of the north, the city of the great king" Psalm 48:1 — click here to hear. Click here for a modern day power grid transmitted from power plant to house. Click here for a recent article on Australia's electricity requirements, with much of it produced by the grid-connected NEM (National Electricity Market) in the east and south-east of the country. Secondary grids are in Western Australia. In 2015-2016, we generated 258,000 gigawatt hours (258 terawatt hours) of electricity. 44% came from black coal (mostly NSW and Qld) and 20% was from brown coal (mainly Victoria). Hence 64% of that year's needs came from coal. The long ramp up to peak capacity means that coal fired power stations frequently operate 24 hours a day, 7 days a week, so are ideal for providing baseload demand, while other more responsive sources of electricity meet peaks in demand. 20% came from natural gas, 6% from hydro, 5% from wind, 2.7% from solar, 2% from oil and 1% from Biomass (IEA data). Click here for a worldwide list of countries, sortable by each country's electricity production in GWh, and by their individual sources. Click here for a timeline worldwide of coal powered production percentages 1960-2015. Click here for nuclear reactor history. Finally, click here for the greenhouse gases climate warming issue. The planet has warmed about 0.8° Celsius since 1880, with two-thirds of that apparently occurring in the past 40 years. Every microscopic transistor in a computer is in one of 2 states: charged or not charged (i.e. it holds a one or a zero). When transmitted to another computer by (1) positive/negative voltage variations on one wire relative to another wire, (2) current variations over copper telephone/telegraph cable (or high performing coaxial cable), (3) on/off light flashes over fibre optic cable using semi-conductor lasers, or (4) frequency variations over mobile wireless, each individual signal is ultimately either a one or a zero. Every 8 signals (or bits) thus have 2 to the 8th power in variations i.e. 256 different characters (or bytes). These 256 characters are sometimes called a character set and, in IBM / Microsoft parlance, a code page. Seven of the eight bits (which control the first 128 characters) have been standardized world wide and are known as ASCII — American Standard Code for Information Interchange, put together in 1960-63 by the American Standards Association subcommittee. In the all encompassing Unicode standard today, this set is referred to as Basic Latin. In 1874 we find the Baudot Telegraph Code. It was transmitted through a five key piano-like machine (click here for a picture) and was based on its sequencing of five contacts (or channels) that enabled 2 to the 5th power i.e. 32 different characters. It was built by Émile Baudot in France in 1874 as a multiplexed (multi-user) system that allowed up to four machines to transmit almost simultaneously (via the use of time-slices) to printing machines synchronized to those signals. It printed its text on a thin paper strip or "ticker tape" (click here for that picture). The 32 character code (ITA1) provided for 26 upper-case letters, then when numbers were required to be sent, a key would be pressed that acted somewhat like a NumLock key. A different keypress would switch this NumLock status off. Combining these codes with punched paper tape for higher speed transmission these Baudot codes were rearranged by Donald Murray in such a way as to reduce wear and tear on the tape perforating machine, and patented in the US in 1901. Interest was shown by Western Union, but with Morse code everywhere (that could run over a two-channel paper tape system, not five) companies were loath to change across. However, work continued on this five-unit code by the Morkrum Company, later known as the Teletype Corporation, that established a stop and a start signal between each character. This enabled asynchronous communication over both telegraph wire and radio. Being asychronous meant it didn't require an external clock signal coordinating the circuitry. Both simpler and cheaper. First to adopt this was the Associated Press news cooperative in the US in 1914, then the Western Union Telegraph Company in 1923, followed by AT & T Corporation who purchased the Morkrum Company in 1930. Murray's Baudot code (known as ITA2) thus became the Teletype (TTY) standard. Early computers, from the IBM 704 in 1954 onwards, used a sixbit code. Each manufacturer would have their own variation covering the upper-case letters, the numerals, some punctuation characters, and sometimes control characters. Seven-bit ASCII was first published in 1963, followed by a major revision in 1967. It was heavily promoted by AT&T in the US, with significant input also coming from the US Army. DEC's PDP-10 family of computers accordingly based their 6-bit character code on ASCII character codes 32 to 95. They then based the 8-bit character code for the PDP-11 on 7-bit ASCII. It was a PDP-10 which Gary Kildall used to develop his CP/M operating system for microcomputers (with ASCII) in 1973-74. ASCII's support for both upper-case and lower-case characters meant that Wang's dedicated word processor which used it was "flavour of the month" in 1976. The success of Wordstar, which ran initially on CP/M in 1979, and in 1982 was ported to run on the IBM, the market leader in both typewriters and computers, meant that 7-bit ASCII's future was secure. But with the next 128 characters defined by the eighth bit — known as the extended set — a large number of proprietary variations (and problems) arose. In 1969, the Japanese government published an industrial standard character set using the eighth bit called JIS C 6220 which they later referred to as JIS X 0201. In 1974, the Soviet authorities designed the KOI-8 character encoding, covering the Cyrillic alphabet. In the US, DEC's computers, the various CP/M installations, IBM's PC-DOS, and then Apple's Macintosh in 1984 all had different extended sets. In 1987, IBM (and Microsoft) launched PC-DOS 3.3 on the IBM PC and PS/2, having separate 8-bit code pages for numerous languages. In the same year a standardised list of 8-bit character sets was launched as a joint exercise by ISO and IEC, referred to as ISO/IEC 8859. In other non-ASCII developments, since 1963-64 IBM had been providing 8-bit proprietary code pages known as EBCDIC that supported multilingual text on their mainframe and mid-range computers. Click here for a full list. In 1976 in Taiwan, Chu Bong-Foo launched Cangjie for traditional Chinese characters by using multiple keystroke characters. In 1984 in Beijing, Wang Yongmin released the Wubi input method on the IBM PC for the simplified Chinese characters used in mainland China. Finally we come to Unicode, a 16-bit cross-platform character set developed by Joe Becker at Xerox, working with Lee Collins and Mark Davis at Apple, and published in 1991. A second volume covering Han ideographs was published in June 1992. Below is the ASCII based character set referred to as the ANSI format, or the ISO-8859-1 character set. It came from the Multinational Character Set (MCS) that had been created in 1983 by DEC for use in their cross-platform VT220 terminal. Because of the non-displayable control characters that DEC had specified for character codes 128-159, many refer to this displayable version as the Windows-1252 code page, launched as part of Windows in 1985. When selecting a character from this extended set (i.e. codes 128-255) in Windows, press the Alt key with the left hand, and simultaneously type a "0" then the number on the numeric key pad (not the top row numbers) with the right hand. When you release the Alt key, the character will be displayed. Note too that characters with a value < 32 which are used for special control commands, do not require the "0" first. The character repertoire for these controls was taken from the character set of Wang word-processing machines, as explicitly admitted by Bill Gates in the interview of him and Paul Allen in the 2nd of October 1995 edition of Fortune Magazine: "... we were also fascinated by dedicated word processors from Wang, because we believed that general-purpose machines could do that just as well. That's why, when it came time to design the keyboard for the IBM PC, we put the funny Wang character set into the machine--you know, smiley faces and boxes and triangles and stuff. We were thinking we'd like to do a clone of Wang word-processing software someday." The remaining characters are C1 (Cross Platform) safe. In Unicode they are referred to as the Latin-1 Supplement. The following characters make up the extended set of the IBM PC or MS-DOS code page 437, often abbreviated to CP437 and also known as OEM Extended ASCII — called OEM as it was built into the original equipment, the video card ROM manufactured with the IBM PC. To select a character from the OEM extended set, press the Alt key with the left hand, and simultaneously type the number on the numeric key pad (not the top row numbers) with the right hand. When you release the Alt key, the character will be displayed. If there is no ANSI (single byte) equivalent to the character being displayed, and you are using Notepad to save the file, be sure to then select Unicode / UTF-8 encoding, and not ANSI. The OEM codes will then be converted by Notepad to their Unicode / UTF-8 equivalent.